Israeli activists are hoping for a “million strong” march for social justice next weekend in protest of the high cost-of-living there and neoliberal economic policies. And while those demonstrations will likely shut down normal life in Israeli cities, there is little chance that the Israeli police will use tear gas or rubber bullets on the protesters. But over the weekend, the Israeli military met a peaceful protest at the Qalandia checkpoint calling for free Palestinian access to Jerusalem with excessive force. This is no surprise. Whatever the issue—water allocation, permits for building, income levels—there exists massive inequalities between Jews and Palestinians as a result of Israeli policies. Israel privileges the Jewish residents it governs and systematically excludes and marginalizes the Palestinians under its control. The Israeli police’s response to the outbreak of the July 14 social justice movement across the state exposes one more separate and unequal facet of Israeli policy: how the state responds to unarmed protests. Israeli Jewish protesters angry about the cost of living do not pose as big of a threat to the Israeli establishment as those who explicitly challenge the occupation and Israel’s system of racial discrimination. That much is clear when comparing security forces’ response to the different types of protests that occur between the Jordan River and the Mediterranean Sea. “Israelis are very hospitable to nonviolent protests by Jews. So I wouldn’t say that the police were too tough on the protesters, especially when you consider what’s going on in the West Bank,” Israeli journalist Noam Sheizaf said in a recent interview on Israel’s social justice movement. The burgeoning protest movement across Israel has held a succession of massive rallies that have brought hundreds of thousands into the street. While there have been some arrests for shutting down roads, Israeli Jewish protesters, who make up the vast majority of those participating in the J14 movement, have been quickly released. Tent encampments across Israel remain untouched for the most part. Even within Israel, there are illustrations of the Israeli government’s ethnicity and political-based policing. The tent encampment that has arguably suffered the most from police harassment has been the one in South Tel Aviv’s Levinsky Park, where African asylum-seekers and Ethiopian-Israelis have joined in. According to the Association for Civil Rights in Israel, officers in uniform, accompanied by non-identified civilians, demolished an encampment there July 24, telling the protesters, “you brought Sudanese here.” And there has been different treatment reserved for those arrestees who are veteran Israeli activists in the joint struggle against the occupation. Meanwhile, the Palestinian unarmed struggle continues to be brutally repressed. Weekly military incursions into Palestinian villages resisting settlements or the separation barrier continue to be a common occurrence, and unarmed protests continue to face down the Israeli military’s might. A recent reporting trip I took through both occupied Palestine and Israel demonstrated these disparities starkly. The West Bank village of Nabi Saleh has been resisting the expropriation of a nearby spring by the Halamish settlement at great cost. Eyad Tamimi, a popular committee activist in Nabi Saleh, told me that everyone in the village has been or knows someone who has been arrested by the Israeli military. Sixty of those who have been wounded by the Israel Defense Forces during the demonstrations are children. “The Israeli government and military thinks Nabi Saleh is a virus, and they want to crush it before it spreads,” says Bashir Tamimi, another member of the popular committee in Nabi Saleh, which organizes the weekly Friday protests. Recently, activists in Nabi Saleh set up their own tent in the village, mirroring Israel’s protests, and carried it during a protest “to tell the Israeli protest movement that their demands for social justice must include implementing the rights of Palestinians.” It was shot at and destroyed by the Israel Defense Forces. The day after I visited Nabi Saleh, I found myself in the Jerusalem neighborhood of Ein Kerem. An environmental-themed tent encampment had been set up there. Israelis milled around, smoked hand-rolled cigarettes and played acoustic guitar. Jarringly, there was no indication that just a short drive away, there existed another protest movement that was being brutally repressed. It is clear that the “virus” of Nabi Saleh that challenges the Israeli occupation will not spread to Israel’s social justice movement. There is a strong aversion in the tent protests to connect social justice to the occupation. And so the apartheid policing that the Israeli security forces practice will continue unabated so long as Israel’s housing protesters do not challenge the marginalization of the Palestinians they live so close to. This will surely be on display on September 3, as hundreds of thousands of Israelis will march without fear of injury the day after weekly protests in the West Bank are met with the Israeli military’s excessive force. 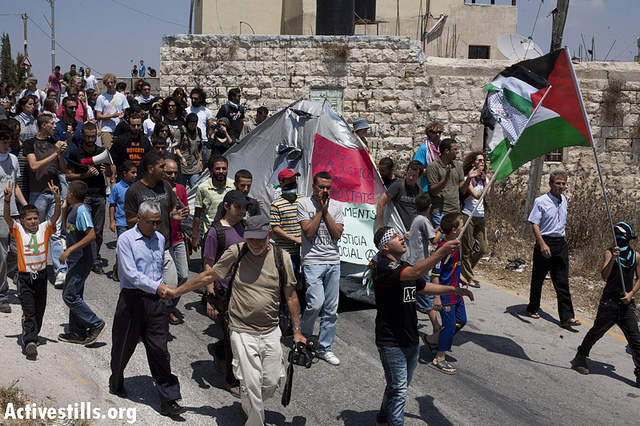 Alex Kane, a freelance journalist currently based in Amman, Jordan, blogs on Israel/Palestine at alexbkane.wordpress.com. Follow him on Twitter @alexbkane.